The approach taken by waterRIDE™ in flood forecasting focuses on leveraging readily available data (hydraulic modelling results, digital elevation models, property GIS datasets, critical infrastructure GIS datasets etc) to provide an indication of likely flood behaviour and, often more importantly, the consequences (or affectation) of such flooding on the community and emergency management efforts. When will they be inundated? When will evacuation routes close? Will critical infrastructure be affected? The forecasting functionality of waterRIDE™ is an invaluable tool for flood emergency management personnel, allowing them to readily visualise a predicted flood, and assess properties at risk using a clear, simple, and fast interface. The forecasting functionality can also be used as a flood planning tool. Various flood levels (“what if” scenarios) can be readily assessed and utlilised in flood planning and evacuation response planning. In conjunction with the unique time varying water surface and live GIS analysis capabilities of waterRIDE™, the floodplain and emergency manager is well equipped to handle and understand flooding emergencies! At its most basic level, flood forecasting using waterRIDE™ is setup and carried out using waterRIDE™ FLOOD Manager. In such a setup, real-time forecast levels at key gauges in the catchment are entered manually into the interface. In more sophisticated systems, the waterRIDE™ FLOOD Forecast Console may be used to completely automate the forecasting process, including running any hydrological forecast models, if required (eg 200mm of rain is forecast over the next 4 hours). In most cases, flood forecasting systems utilise a base library (or “data cube”) of design flood modelling repressing the flow of floodwaters for a range of floods. A prediction at a gauge in the floodplain can be used to define a forecast flood surface by interpolating between two known (modelled) surfaces for the given reading on the gauge. As this interpolation is applied across the entire floodplain, the full 2-Dimensional water surface profile is preserved (ie it is not flat profile or longitudinal profile based). In some catchments, the spatial variation in rainfall and resulting flooding (the fact that different parts of the catchment experience different magnitudes of rainfall and flooding in any given storm) is accounted for through the use of multiple gauges in the different parts of the catchment. In such a case waterRIDE™ can warp the interpolated surface to account for the different magnitudes of flooding in different parts of the catchment. Once the flood surface has been interpolated, it can be integrated with GIS datasets to determine the affectation of the likely flooding. This may include information such as depth over floor, time of closure of evacuation routes, critical infrastructure operability status etc. Although there is substantial functionality “off the shelf” in waterRIDE™ FLOOD Manager, running a forecast system in concert with waterRIDE™ FLOOD Forecast Console allows systems to be developed that operate the way you want them to, rather than making your operations fit the system! How flexible is a waterRIDE™ based forecasting system? You are issued with peak flood levels at a gauge (or number of gauges in a catchment) or are provided with forecast flood levels at a certain time(s) in the future (ie how the flood will build up in time) by an external agency, or calculate these yourself. Upstream river gauges can be used to determine likely flood behaviour at downstream locations. Live rainfall gauge readings combined with forecast rainfall grids can be used to run self-calibrating hydrologic models to determine likely levels at key locations in the catchment which are then converted into likely time-varying flood surfaces. Hydraulic models can be run in real-time using forecast river flows or actual (live)/forecast rainfall patterns. Storm surge forecasts can be used to determine likely ocean driven inundation. Multi-dimensional ‘libraries’ of additional climatic datasets such as: ocean levels, antecedent rainfall, wind speed, and varying rates of rise can be used to account for any interdependence of flooding with other variables, as required. At its most basic level, flood forecasting using waterRIDE™ is setup and carried out using waterRIDE™ FLOOD Manager. In such a setup, real-time forecast levels at key gauges in the catchment are entered manually into the interface. In more sophisticated systems, the waterRIDE™ FLOOD Forecast Console may be used to completely automate the forecasting process, including running any hydrological forecast models, if required. 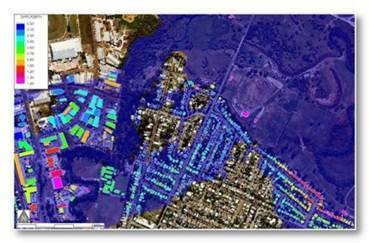 The approach taken by waterRIDE™ in flood forecasting focuses on utilising readily available data. The minimum input data requirements are flood model results for a range of flows, a terrain model (DEM), and a GIS file of gauge locations where the forecasts are being provided. 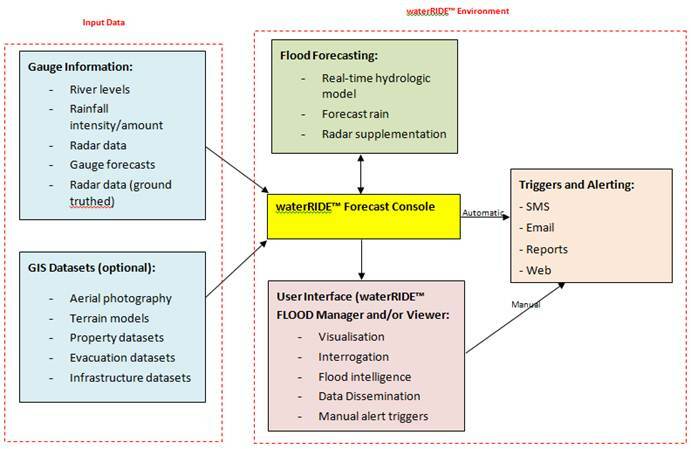 As you can see, the data components of a waterRIDE™ based flood forecasting system are deliberately kept simple. 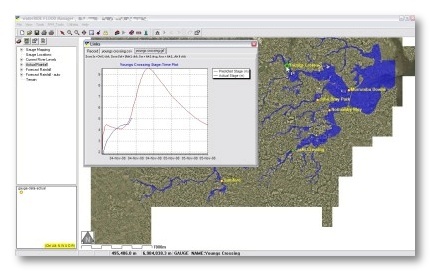 At its most basic level, flood forecasting using waterRIDE™ is setup and executed using waterRIDE™ FLOOD Manager. In such a setup, real time flood forecasts (flow or level) at key gauges in the catchment are entered manually into the interface, with mapping and affectation processing occurring when the “run” button is clicked. This type of system can be readily setup using only waterRIDE™ FLOOD Manager, or expanded by using waterRIDE™ FLOOD Viewer licenses used to distribute “uneditable” data to end users in an easy to use manner. In more sophisticated systems, the waterRIDE™ FLOOD Forecast Console may be used to completely automate the forecasting process. In some systems, external hydrologic forecasting engines have been setup and executed as part of the workflow. 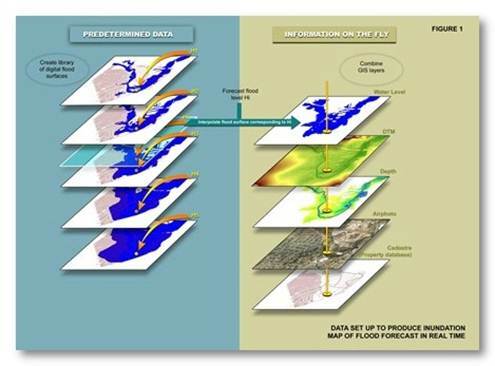 Such systems involve the automated collection of actual rainfall data with and the incorporation of forecast rainfall, which is then routed through the hydrologic model. Ultimately, the waterRIDE™ FLOOD Forecast Console will collect a file (CSV, XML, online “GET Request” etc) containing the static or time varying gauge level forecasts. These gauge levels are then used to drive the interpolation routine. Mapping and flood intelligence is then created and distributed according to the user-specified workflow. All this operates as an automated, scheduled process with full logging and error capture. An alternative approach is to substitute a real-time hydraulic model for the interpolation algorithm. In such systems, when the hydraulic model is executed, the results are automatically converted into waterRIDE™ format for use and the derivation of associated flood intelligence. What are the benefits of the waterRIDE™ forecasting system? Robust/Stable – as the interpolation engine uses pre-determined datasets, there is no chance of model crashes rendering the system unusable. Fast – likely flood surfaces can be calculated in as little as a few seconds! Powerful visualisation and interrogation – all waterRIDE™ interrogation and visualisation tools are available to analyse the forecast surface, just as if it was one of your design flood model surfaces. Simple to use – the waterRIDE™ interface is simple and intuitive to use, with unnecessary complexity hidden from the user unless desired. The user does not need to have hydraulic/hydrologic modelling experience to run the tool. 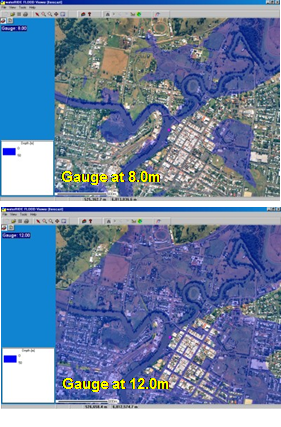 High quality results – by leveraging high quality flood modelling, the outputs are of the same order of quality. Cost effective and easy to setup – by deliberately focus on using readily available data, a working waterRIDE™ flood forecasting system could be setup in an afternoon! As a minimum, waterRIDE™ FLOOD Manager will be required. The operation of the system can be expanded using waterRIDE™ FLOOD Viewer and the waterRIDE™ FLOOD Forecast Console. Details on each of these products can be found on the “products” page.